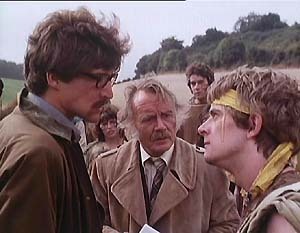 The 1979 mini series Quatermass, made by Euston Films, was one of the most ambitious drama projects ever undertaken by ITV, and is one of the few science-fiction TV shows that was squarely aimed at an adult audience. The story, which is set in a not-too distant future where society has practically collapsed, is fundamentally about the conflict between science and magic. It's a remarkable series, and, although some of it's trappings seem rather dated, it could also be argued that its concerns are more relevant today than they were a quarter of a century ago. 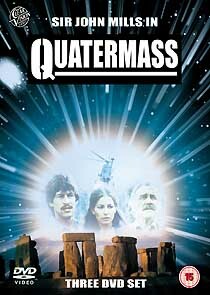 The four-part series had a healthy £1.5m budget, which the producers intended to offset by creating a feature-length condensation of the series which would get a theatrical release overseas, titled The Quatermass Conclusion. This feature-length (102 minute) version has been available on several different VHS labels over the years (it was one of the first pre-recorded tapes released, on the Thorn EMI label, and was subsequently reissued as a sell-through title by Video Collection International). The episodic version was subsequently released on tape by Video Gems, who lumbered the tapes with the crappiest covers imaginable. Completists will be relieved that their three-disc set contains not only the four fifty-odd minute episodes, but also the movie version, (spread across three separate DVD5s), but might wince when they realise that this is reflected in the price of the set. In the context of this set, the movie version is practically redundant, and should be considered as little more than a bonus item. The movie version isn't merely a distillation of the mini-series: since it was always the intention to present the story in two versions, the movie version includes some especially-shot material (linking scenes, shots where certain characters aren't present, etc). Comparing the two side-by-side might prove an interesting exercise, if anyone's interested in the nuts and bolts of the production. ClearVision's DVDs present both the series and movie in full-frame format, with the original mono audio intact. Little - if any - effort has been made to re-master the series. Instead of returning to the original 35mm negatives, which might have resulted in results as astonishing as those on Carlton's Region 2 UFO discs, ClearVision has sourced the disc from 16mm prints (and rather battered ones, if the frequent splinter-like scratches are indicative). This is perhaps understandable, since making a new transfer from the negatives - even if they were to be made available, which may not have been the case - is not cheap. What is unforgivable (especially considering that this is a product with a premium price attached to it) is that there are several noticable examples of analogue tape dropout, strongly suggesting that the discs were mastered from inferior Beta-SP recordings. The image has a slightly muted, earthy colour balance, which may have been intentional, but seems to extend to shots where you'd expect a more naturalistic palette. (Some shots in the last episode, An Endangered Species, were deliberately tinted green, to suggest the sickness beginning to manifest itself). Image contrast is generally poor, with areas of the picture that should be pitch black appearing charcoal gray. The picture has reasonably good detail (you can read some of the background signs, about fuel conservation and looting, for example) but this is sometimes blurred by excessive video noise reduction, or inadequate MPEG encoding. There are regular signs of edge-enhancement, creating halos around areas of stark contrast. Occasionally shots suffer from a pulsing effect, which makes some details "snap" on and off, and temporarily obliterates others (this is sometimes referred to as "noise pumping" or "I-frame pumping", since it's related to the way that information is compressed to MPEG format). The series has an average bitrate of 5.22Mb/sec, but close examination reveals that the level rarely ever wavers below 4.5Mb/sec and 5.5Mb/sec, suggesting some very crude, non-adaptive compression has been applied. Images are often smeary, but there are no prominent tiling artefacts. The episodes also suffer from another problem that a new, state-of-the-art telecine transfer might have completely eliminated: film weave. This is an almost constant irritant, (the second episode, Lovely Lightning, is especially bad). There are even a couple of instances where the image jumps completely (the opening shot of the third episode, What Lies Beneath, for example). Since the series was presumably framed with half an eye on the theatrical presentation, it's quite likely that the cinematography was designed to be matted from the full-frame version (seen on the four-part TV version) for widescreen presentation. A widescreen presentation of The Quatermass Conclusion might have been entirely legitimate (many shots seem to have more headroom than they need). 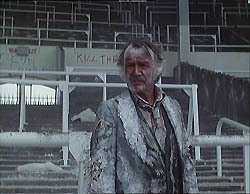 The framing on The Quatermass Conclusion often crops off picture information that's present in the mini-series version. The audio on both version is presented at 224kbps, and has minor wow and flutter. Dialogue is well-recorded, and always intelligible. Purists might like to know that there's been some tampering with the episodes: the opening Thames logo's are intact, but the end logo has been replaced with a modern version. The advert break bumpers have been removed, but this seems to have been handled responsibly, and most now simply appear as fades to and from black (thankfully, there's none of the abhorrent digital zoom shenanigans that blighted ClearVision's Callan discs here). Still, it would be nice if disc producers finally realised that their core customers overwhelmingly want them left intact. Episodes three and four have spoken "previously on..."-type introductions. If there was ever one on episode two, it's not there now. The discs have very slick menus, which are easy to navigate. (Hey, why not spend some of that money on some basic cleanup?!) The set comes with a fourteen-page printed booklet, offering a potted history of the various Quatermass incarnations. The discs themselves carry some comprehensive production notes, by Action-TV's Andrew Screen. Annoyingly, these are split across the two discs of the mini-series. 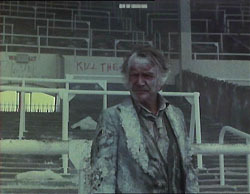 The Conclusion disc contains the set's only tangible bonus feature: an eighteen minute interview with Quatermass creator Nigel Kneale, from the Sci-Fi Channel series Glimpse. 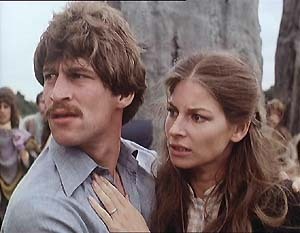 This is a wide-ranging interview, which is naturally focused on his work on the various Quatermass incarnations. 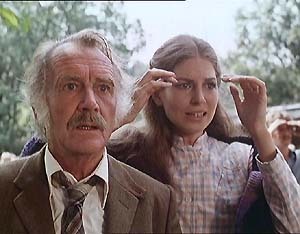 While Kneale fans will welcome the chance to add the Quatermass series to their growing DVD collections, many are likely to be disappointed with the penny-pinching transfer, and the lack of extras. 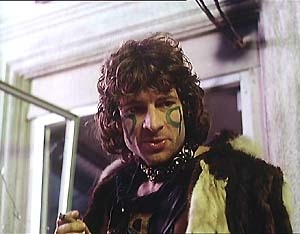 Kneale has been more than willing to contribute commentary tracks in the past (on Anchor Bay's The Abominable Snowman and Quatermass 2 discs, for example), and the lack of one here - even if it was just on one episode - is a big disappointment. It's not just Kneale's input that's missed, of course. What about contributions from the series' stars, or the director? With a tightly focused market, you only get one shot at getting something like this right, and ClearVision's DVD set sadly makes it that much more unlikely that someone else will do something more substantial later. There's more information on this title at ClearVision's web site.